Sally Solari is busy juggling working at her family's Italian restaurant, Solari's, and helping Javier plan the autumn menu for the restaurant she inherited, Gauguin. Complicating her hectic schedule, Sally joins her ex-boyfriend Eric's chorus, performing a newly discovered version of her favorite composition: the Mozart "Requiem." But at the first rehearsal, a soprano, Gayle, confides in Sally that her tenor boyfriend died falling from his roof--and she doesn't think it was an accident. Now Sally's back on another murder case mixed in with a dash of revenge, a pinch of poison, and a suspicious stack of sheet music. And while tensions in the choir group start to heat up, so does the kitchen at Gauguin--set aflame just when Sally starts getting too close to the truth. Can Sally catch the killer before she's burnt to a crisp, or will the case grow cold as yesterday's leftovers? 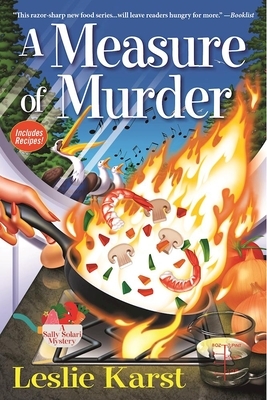 In a stew of suspects and restaurateurs, trouble boils over in the second in Leslie Karst's tasty and tantalizing Sally Solari mystery, "A Measure of Murder." Leslie Karst has degrees in English literature, law, and culinary arts. After graduating from Stanford Law School, she worked for twenty years as a research and appellate attorney before retiring. Karst now spends her time cooking, gardening, cycling, singing alto in the local community chorus, and of course writing. She and her wife, Robin, and their Jack Russell mix, Ziggy, split their time between Santa Cruz, CA and Hilo, HI.